Wesley So won the rapid portion of Paris Grand Chess Tour after drawing all his games today. However, unlike in Leuven where he had a three-point lead over the field going into the blitz, he only has a one-point lead now, thus putting himself in a more vulnerable position. Sergey Karjakin and Hikaru Nakamura are now tied for second place and are only one win away from catching the leader. There were several notable performances which shook up the standings. Maxime Vachier-Lagrave scored 2.5/3 and is now tied for fourth place and three points behind So. 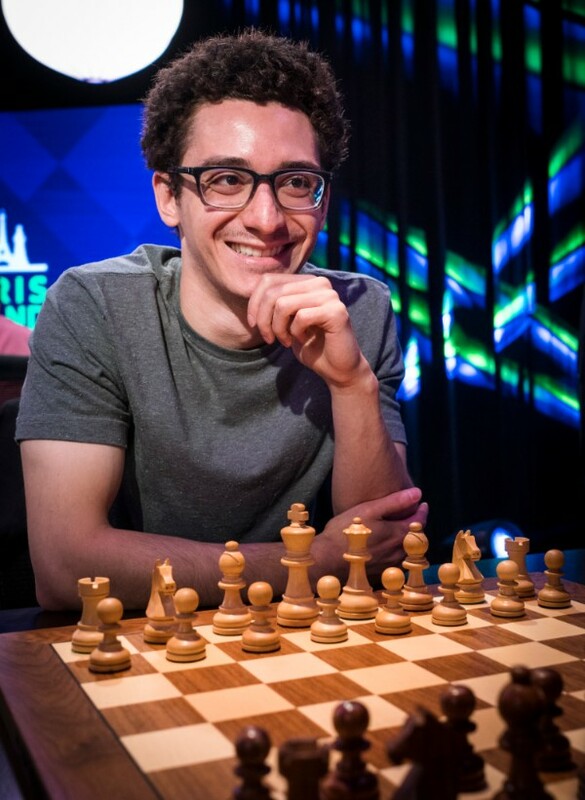 So’s countryman Fabiano Caruana who has been struggling both in Leuven and Paris also had an excellent showing today with 2.5/3 and finds himself four points behind the leader. The weekend of blitz promises to bring a lot of excitement! There were no changes in the standings at the top as they all drew their games whereas the two bottom finishers started to slowly move up. Fabiano Caruana blitzed out his excellent preparation against Vladimir Kramnik and after the opening had just as much time left on his clock as he did at the beginning of the game. There was one moment in the game where Caruana blundered allowing his opponent to completely turn the tables. Alas, the former World Champion missed his chance and went on to lose the game. Maxime Vachier-Lagrave did not hide his intentions of going after his opponent’s throat. He launched an attack against Shakriyar Mamedyarov’s king starting on move seven and won the game twenty five moves later when the Azeri grandmaster succumbed to the pressure. Wesley So maintained his lead by drawing his closest rival, Sergey Karjakin. His other rival, Levon Aronian, lost to Fabiano Caruana, who seemed to have finally found his form by that point. After winning a pawn, the American showed flawless technique to bring the full point home. Viswanathan Anand and Hikaru Nakamura played a truly epic battle where they both ran their kings to the opposite side of the board. The topsy turvy battle eventually ended in Nakamura’s favor. 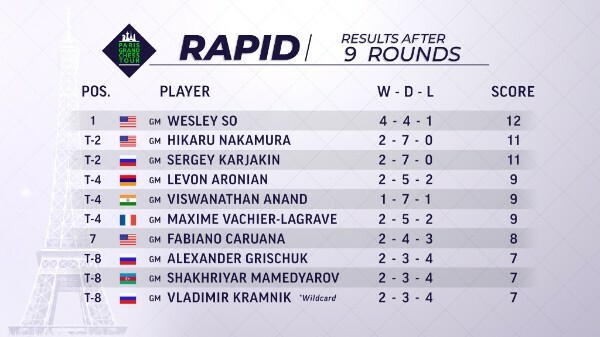 Shakriyar Mamedyarov recovered from his loss with a win over Alexander Grischuk while Vladimir Kramnik and Maxime Vachier-Lagrave drew their game. The draw against Viswanathan Anand who suffered a heartbreaking loss the round before was enough for Wesley So to secure his first-place ranking. 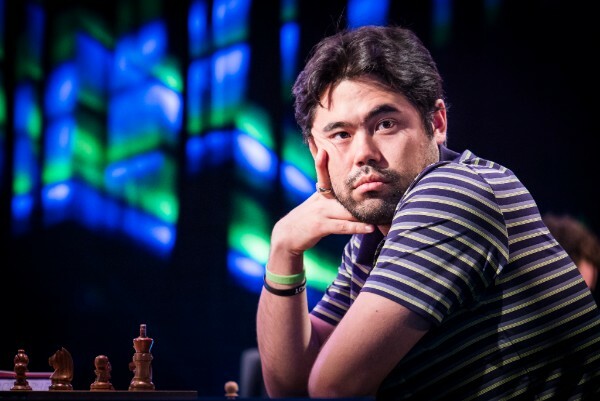 Hikaru Nakamura and Sergey Karjakin drew Shakriyar Mamedyarov and Fabiano Caruana, respectively, thus staying a point behind the leader. 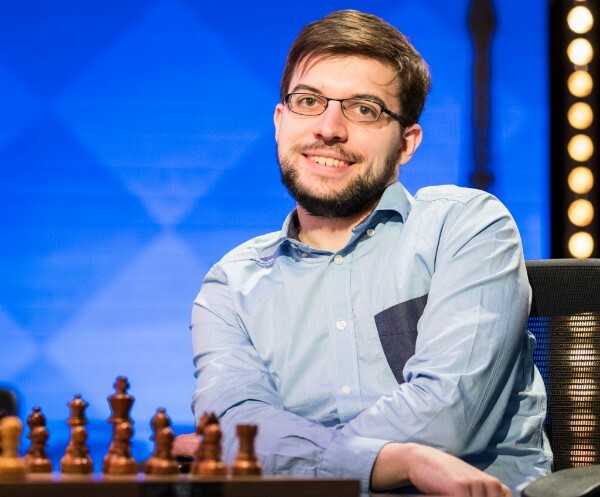 Levon Aronian suffered his second loss in a row, helping his opponent Maxime Vachier-Lagrave improve his position in the standings significantly. The only other decisive game was between Alexander Grischuk and Vladimir Kramnik, which was determined in the time scramble. The players kept blundering the game away, until Grischuk made the final mistake and was forced to resign. All information is available on GrandChessTour.org. Live commentary by GM Yasser Seirawan, IM Jovanka Houska, and GM Alejandro Ramirez. As last year, GM Maurice Ashley will be on-site in Paris to interview players and will be joined by GM Romain Edouard. The English broadcast will be joined by the Russian commentary team of GM Evgenij Miroshnichenko and GM Yaroslav Zherebukh and French team of Astrid Bard (Canal+ Anchor), IM Jean-Baptist Mullon, GM Yannick Pelletier and IM Almira Skripchenko. Watch live.